Anna Madden Living: It's not a man thing? Every day I have piles of dirty laundry. Because I am so busy, I do the laundry at night and fold them after we put our kids in bed. 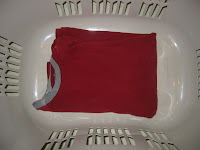 That means I fold them while my husband, Angus, and I watch tv shows, so, fun huh?! One night, I asked Angus to help me to fold the laundry and he didn't mind doing that. But when I checked his folding, omigosh ... what a mess ... especially the nice clothes. I laughed, but I didn't want the nice clothes to be wrinkled, so I did his folding all over again. Angus laughed too but was confused when he saw me doing his folding all over again. He thought he did a great job. Since then, I only let him fold the easy stuff like shorts and socks.